By the time I was in my tent and ready to blog last night, I was useless. I was completely drained and knew it was because I was going to start my period. I couldn’t even muster a coherent thought, so I skipped blogging and fell asleep at 9pm figuring I could write it more easily in town today with my laptop, which was still at our Moab hosts’ house. I woke up at 11pm having sweat through my pajamas and feeling so heavy I could barely lift anything. My regular monthly fun. I was awake on and off through the night and woke with a start to hear Katherine getting ready. 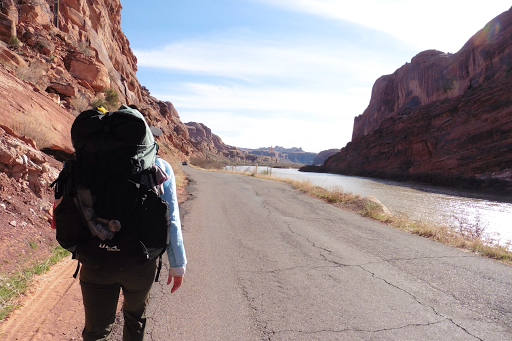 I wasn’t far behind her when I left camp at 7am, but we split when we hit Moab a couple miles from camp. Katherine had errands to run in town and I headed over to Jason’s house, where we stayed before the trail. Our plan was to spend the day in town and hike out about 5mi to camp. I figured I’d get tons done with my laptop, but of course I didn’t. I was drained and could have slept all day, but didn’t. I did the regular town chores and time just flew by. I tried to do the blog post from yesterday, and to make a long story short, I managed to erase everything I wrote after spending a good 45mins on it. It was so demoralizing. I rewrote it as best I could and then realized how little I had done all morning in town. Katherine returned from her errands, which included getting a new pack that can support more weight for the big carries on the Hayduke. She ended up going with the ULA Catalyst that can support 40lbs and sent home her sentimental favorite ZPacks ArcBlast. We’ve realized that either she drinks a lot of water or I drink very little. It’s probably the latter…but it works for me. I’ve never needed lots of water and it will definitely help me on these long carries, but it seems to be that I drink a half to two-thirds what Katherine does. For example, on our carry out of town tonight, she had 5L and I had 3L…so she was carrying 4lbs more than me. Hence, the new pack. This leg is an interesting one for resupply. We will not his a true town (and our first zero) for 12 days…there is a chance that I will not have a shower or cell service in those 12 days, so don’t worry if I don’t post. 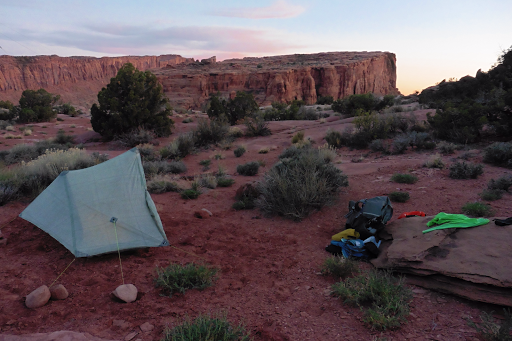 There are two small places to resupply between here and Hanksville, but it ain’t easy. The first one is about 4 days from here at the pricey Needles Outpost where they won’t hold hiker packages and the owner’s reputation is less than enjoyable. Then 5 days from there is a Marina in Hite where they are open 3hrs/day and might have staff there to accept a box if all works out. My strategy is to avoid going off trial to Needles Outpost and just carry 9 days of food. Katherine is going to go there so she can carry four days. For some reason, I like the idea of going 9 days and I’ll be able to hang out at a formal campground on trail to relax while Katherine resupplies in a few more days. 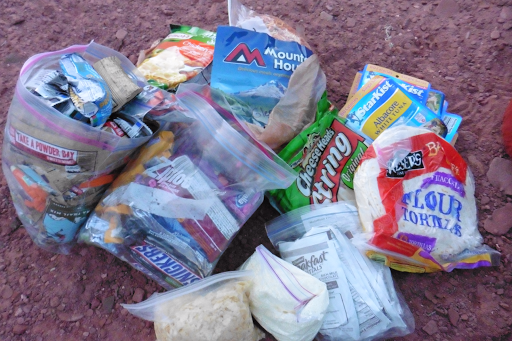 All this to say that I’m proudly carrying 9 days of food and three liters of water and it doesn’t feel bad at all in my Gossamer Gear Mariposa pack. Here’s what my 9 days of food looks like. There are over 50 bars(including candy bars) there! The alternate is four miles shorter, but also more scenic, so we decided to go for it. It was on a trail that is also a mountain bike trail called Jackson Trail. 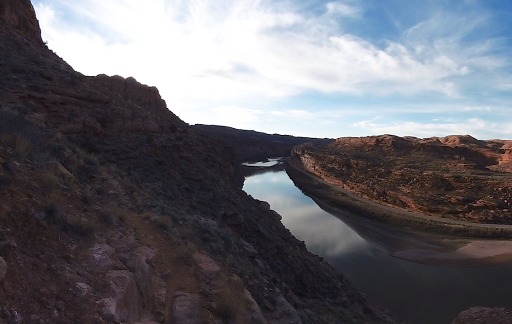 It was great to hike up above the Colorado which we will be along and cross multiple times over the hike. Lighting was difficult with the setting sun, but you get the idea. When we got up top, it was 7pm, and we decided to go with the good camping area rather than start a difficult decent and unsure camping. Like the last two nights, it was difficult to pitch our tents because the stakes either hit rock underneath or the ground was too soft to hold. I used many rocks and figured it out, but Katherine had too much rock hiding shallowly under her spot a had to cowboy (sleep out without a tent). It is supposed to drop to the low 30s tonight, so it will be a good test for her new ZPacks zero degree bag. We both get cold easily and I don’t know how she’s going to be able to do it! Have I mentioned how slow my camp routine has been too!? I’m sure it will come back, but it’s been all out of whack so far. Part of the frustration is that the terrain here has made for some sand and loose dirt tent pitches and it takes much longer! We joked tonight about caving an splitting a two person free standing tent, ha! I think everything out here takes longer in general. I haven’t mentioned this, but with the terrain and navigation, daily mileages will be pretty low out here with daly mileages in the teens normal. Hitting over 20 will be rare, but doable. We’ve estimated 15mi/day just to be careful. It was just as we got to camp that I realized I forgot something…something really important that I hadn’t used last leg and was wanting for this longer leg…I left my GPS at Jason’s house!!! I had put it on the balcony to get a signal and make sure it was working ok before I left and totally left it out there! What an idiot! Good thing is that I have all I need on my phone and Katherine as her phone and GPS, so we’ll be ok. I’ll get it back in 12 days when I hit town. I guess something’s just don’t change and I am cursed with leaving something behind once again! Ugh! I may be off my game, but you can always count on me to lose something or leave something behind. Yes, I know you are all laughing…glad I can entertain. Not sure when I’ll get service again, but I’ll get the posts up when I can…off to begin my 12 day leg until I reach a shower…whew!